Now past the halfway mark in its mission at the giant of our solar system, NASA’s Juno spacecraft continues to return tantalizing information about the planet Jupiter, including the up-close study of wave trains in the planet’s atmosphere and solving a 39 year old mystery surrounding lightning in the planet’s atmosphere. Officially passing the halfway mark in its mission on 21 December 2018, NASA’s Juno spacecraft dove to within 5,053 km (3,140 miles) of Jupiter’s clouds on the craft’s 17th perijove (moment of closest orbital approach to Jupiter). The December 2019 perijove marked Juno’s 16th science gathering dive and completed the task of obtaining global coverage of Jupiter. The long-delayed halfway point came after NASA extended Juno science operations in the middle of 2018 – an extension which now allows the craft to complete its originally planned mission. After entering a preliminary 53-day orbit of Jupiter on 4 July 2016, Juno was to reduce its orbital period to a 14-day primary science orbit. However, just days before this was to happen, NASA noted an anomalous reading on helium valves on Juno’s main engine, valves similar to the ones used on the Japan Aerospace Exploration Agency’s Akatsuki spacecraft’s main engine that malfunctioned in December 2010. Not wanting to risk a potentially mission-critical (or ending) issue with Juno’s main engine, NASA decided to leave Juno in its 53-day highly elliptical orbit. 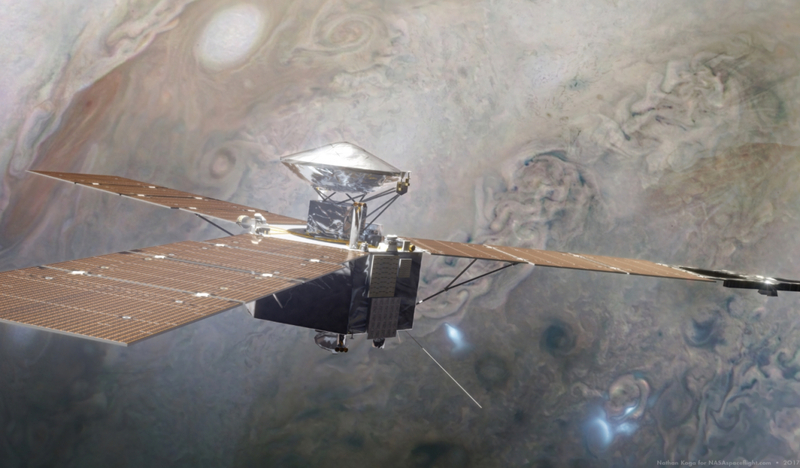 The issue with this decision was that a 53-day orbit would only permit bare minimum mission success by mid-2018 – the time when Juno’s primary mission was to end and NASA believed the craft’s systems might be too fried by the planet’s harsh radiation field to continue successful, controlled operations. Thankfully, as tends to be the case with NASA spacecraft, Juno’s radiation-hardened systems held up much better than expected, and U.S. space agency officially extended the mission until July 2021, thus allowing the craft to complete 35 of its originally planned 37 dives toward the planet. Despite the fact that Juno had only completed 14 of its 35 perijoves by the time its mission was originally set to end, the craft had still returned a treasure trove of information that has allowed scientists to peer deeper into Jupiter and unlock some of the planet’s mysteries that had thus far eluded them. “We have already rewritten the textbooks on how Jupiter’s atmosphere works and on the complexity and asymmetry of its magnetic field,” said Scott Bolton, principal investigator of Juno, Southwest Research Institute in San Antonio, while marking the halfway point of Juno’s mission. 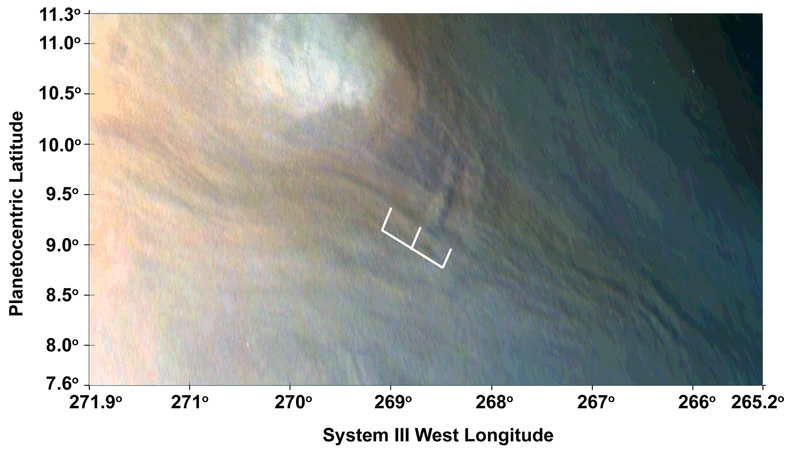 Included in the “rewritten textbooks” so far is Juno’s up-close study of wave trains in Jupiter’s atmosphere. These Jovian wave trains were first discovered by NASA’s Voyager 1 and 2 spacecrafts during their flybys of the planet in 1979. But for the first time, Juno has allowed scientists to calculate distances between the waves as well as their heights. “JunoCam has counted more distinct wave trains than any other spacecraft mission since Voyager,” said Glenn Orton, a Juno scientist from NASA’s Jet Propulsion Laboratory. However, mysteries still remain with this phenomenon, with waves observed in multiple configurations traveling in multiple different directions. “The waves can appear close to other Jovian atmospheric features, near vortices or along flow lines, and others exhibit no relationship with anything nearby,” said Orton. Presently, scientists believe wave trains form from disruptions in Jupiter’s atmosphere because of thunderstorm updrafts or outflows around other atmospheric features – but more data from Juno is needed before this can be confirmed. Since Voyager 1’s flyby of Jupiter in March 1979, scientists have been puzzled by one aspect of lightning observed in the planet’s atmosphere. For hundreds of years, scientists believed lightning in Jupiter’s atmosphere was possible. Voyager 1’s confirmation of that wasn’t the surprise, it was the revelation that radio signals from the lightning didn’t match the radio signals produced by lightning on Earth. “No matter what planet you’re on, lightning bolts act like radio transmitters – sending out radio waves when they flash across a sky,” said Shannon Brown of NASA’s Jet Propulsion Laboratory. On Earth, radio signals from lightning are detectable in a megahertz range. But Jupiter’s lightning, prior to Juno, had only ever been detected in the kilohertz range of the radio spectrum. “Many theories were offered up to explain it, but no one theory could ever get traction as the answer,” said Brown. Data from Juno’s first eight perijove science dives returned 377 lightning detections, every single one of which was observed in the megahertz range. So why was Juno able to detect lightning in this range when Voyagers 1 and 2, Cassini, and Galileo all failed to? The answer, as it turns out, might come down to distance. Juno passes much closer to the lightning than any of the four previous spacecrafts have. Coupled with Juno’s proximity to the lightning is the specific megahertz frequency at which Juno observed the lightning, a radio emission range that passes easily through Jupiter’s ionosphere – providing another tantalizing insight into Jupiter’s composition and atmospheric characteristics. But this lightning observation wasn’t the only element Juno has observed in terms of Jovian lightning. 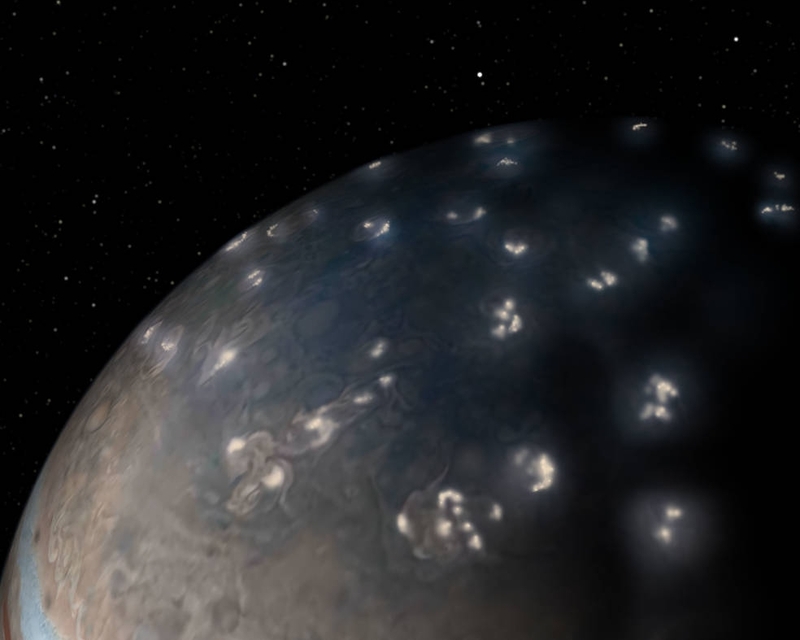 On Earth, lightning discharges largely cluster around the equator while on Jupiter they congregate around the poles. On the surface, it might seem that this is the exact opposite, but in fact, the same underlying mechanism for lightning generation explains the different locations for lightning clustering on the two planets. That answer is heat. Heat on Earth is a largely derived from solar radiation, with Earth’s equatorial region receiving more direct solar radiation than its poles. On Jupiter, most atmospheric heat is generated from inside the planet itself, welling up more prominently at the poles than at the planet’s equator. Why? Because the solar radiation received at Jupiter’s equator actually inhibits the rise of warm air from within the planet into the upper atmosphere, thus suppressing lightning generation at Jupiter’s equatorial regions. “These findings could help to improve our understanding of the composition, circulation and energy flows on Jupiter,” said Brown. However, Juno has yet to answer another mystery surrounding Jovian lightning: why does Jupiter’s northern pole have a significantly higher lightning concentration than the southern pole? 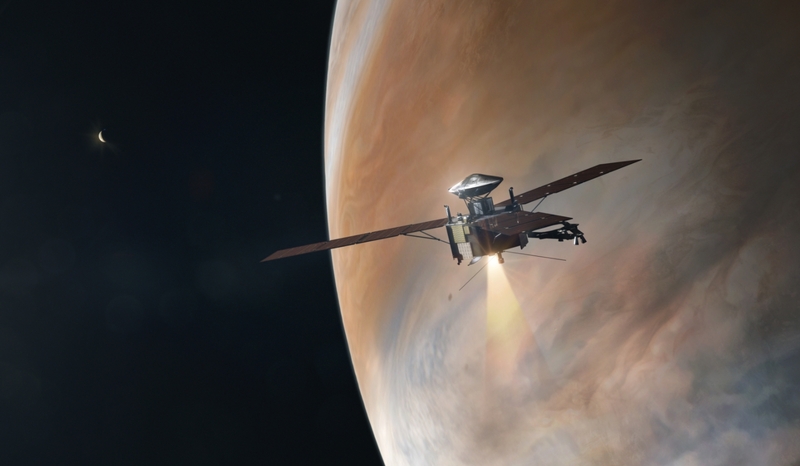 The answer to this question and numerous others might come from Juno during the second half of its mission. As with Galileo before it and Cassini at Saturn, Juno’s mission will end on 30 July 2021 with a destructive entry into Jupiter’s atmosphere in order to execute planetary protection measures to prevent Juno from accidentally contaminating one of Jupiter’s potentially life harboring moons.